The leading sustainable agriculture company is presented with several long-term opportunities that could cause its stock to rise. Can a stock that has risen by over 540% in the last decade really continue to climb? Well, that all depends on the current state of affairs at the company and the market opportunities it can realistically target and capture. 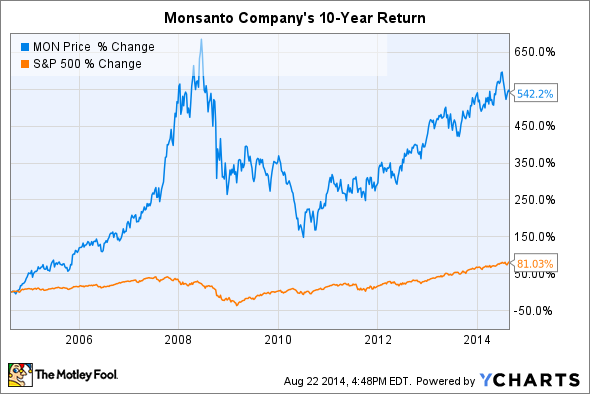 When it comes to the sustainable agriculture business of Monsanto Company (NYSE:MON) the future looks pretty bright -- despite the stock's meteoric 10-year rise. Growth won't be achieved without headwinds, but management's strategy to grow the bottom line in the next five years should catch the eyes of growth and value investors alike. While Monsanto Company's 2010 EPS registered at a respectable $2.39, projects are under way to push 2014 EPS over $5.00 and 2019 EPS over $10.00. That probably grabbed your attention, so let's evaluate three reasons Monsanto Company's stock could rise. Flavr Savr, the genetically modified tomato, may have been a market dud when introduced in 1994, but Monsanto Company learned from the experience of Calgene (the company it acquired) to develop what may be the world's best cross-breeding platform. It may seem improbable that a company so closely associated with biotech crops could have a substantial future in vegetables -- or would even care about them for that matter -- but it may not be long before the ripest and juiciest peppers, melons, and cabbages in the produce aisle are supplied by Monsanto Company. Oh, and another thing, they'll be organic. Third quarter sales of vegetable seeds grew just 2.3% compared to the same period in 2013, but don't write off the segment just yet. As Ben Paynter reported in Wired earlier this year, Monsanto Company has revolutionized cross-breeding by incorporating next-generation biology tools including novel genome sequencing, data analysis, and genetic prediction tools. In other words, Monsanto Company can peer into the genome of, say, a lettuce to determine which regions code for a specific trait and alter the region with software (rather than growing a plant) to determine which changes need to be made to produce the desired trait. Then, researchers can predict which traits will be passed on through breeding, how long it will take, and begin crossing plants to produce the ultimate lettuce. Such a technology platform could create a multi-billion business that becomes the next industry standard. The word "game-changer" gets tossed around an awful lot these days, but Monsanto Company really could be sitting on a few different game-changing products. The value is in the company's approach. Similar to the way it transformed agriculture by streamlining pest management systems with Roundup-Ready corn and soybeans, future products will once again challenge the status quo. The most promising long-term portfolio and product development area lies in microbials, or compounds produced from microorganisms that can be applied to fields to naturally control pests, protect soil, improve productivity, and more. Agricultural biologicals could one day complement or even replace agricultural chemical products such as glyphosate -- reducing environmental impact while increasing yields. For instance, Monsanto Company's BioDirect brand uses molecules found in nature to create topically applied crop protection products. A microbial pesticide, or biopesticide, could be a Bt spray that controls worms or a spray or seed that incorporates RNAi technology to selectively target viruses that prey upon pollinators such as honeybees. There are currently four BioDirect projects in the pipeline aiming to do just that, but it will be several more years before they're commercially available. Investors are well aware that the merger with Syngenta is no more, but successful acquisitions in recent years have turned out to be incredibly wise. Some of the BioDirect products in development today came from the acquisition of Beeologics in 2011. Similarly, the company's acquisition of The Climate Corporation in October 2013 is advancing ahead of schedule. Monsanto Company's climate platform merges big data and agriculture to provide real world recommendations and solutions to farmers in real-time. Simple things such as planting a few days sooner or altering a farm's irrigation schedule could add up to more profitable harvests. It has all of the potential to become the Internet of Things for farmers -- and it's off to an explosive start in 2014. In the first half of the year the number of partners has increased from one to six, which collectively represent over $60 billion in agricultural sales and over 40 million acres of cropland dedicated to the Climate platform. Monsanto Company appears to be firing on all cylinders heading into the second half of the decade. With strategic acquisitions and partnerships developing a number of products with multi-billion dollar potential, there are few reasons to doubt that management will meet its 2019 EPS target of $10.00 per share. Of course, Monsanto Company stock could rise or fall for any number of reasons. All investors can do is understand the company and prepare for potential opportunities or headwinds. In the long term, headwinds may be minimized for a business as important as Monsanto's.